The setting sun gave the forest behind my backyard a nice autumnal glow, so I tried it again with my cheap digi-snapper. This time was quite a disaster: too shaky, too much noise and a bit too wet but it is recognisable at least that the reddish thing in the background could be a forest. With a bit of good will. The whole process was automated with Hugin and I was a bit lazy when I checked the result, so the fence in the foreground does not fit very well. No further postprocessing because made no sense: you cannot change things that are not there in the first place. But I decided to play around with the different projections this time. More after the fold. The above picture is in the fisheye projection and shows the most of what I photographed. The next one is the typical equirectangular projection of most of the panorama pictures you can view with a panorama viewer. The number in parentheses at the end is the number of the projection as needed for the command line tools but hard to find, the list is not in every man page. Because this is the projection used for those very large panoramas (e.g. : a cityscape, the inside of large buildings etc.) I added some whitespace to make the full round. That got very large, so I reduced the size to 25% of the original and added some postproduction here to avoid the reception of a dull blob of pixels. Which it still is to some degree. The next one is the rectilinear projection. You can use that projection for e.g. : long walls, large buildings or similar things that are flat and ahead. Then comes the cylindrical projection. The FoV (vid. 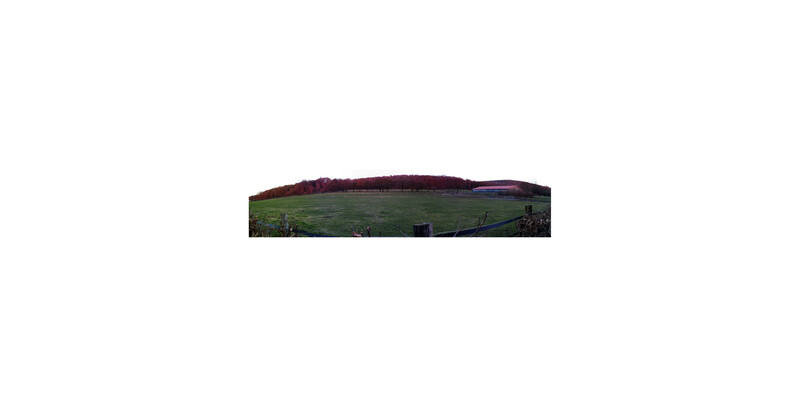 : Field of View) of this panorama is 136° horizontally, so the circumference of the full circle is a small bit less than 2.65 times larger than the width of the picture. The next one in the row of projections would be the fisheye projection, but we had that already, so number five is the Mercator projection. Oh, my, the list starts with zero, of course, so the next one would have been the stereographic projection, but here it is. We had number five already, so further on to number six which is the trans-mercator projection. It gets followed closely by the fourth prime the sinusoidal projection where I am not quite sure about the correct placement of all of the vocals in sinusoidal. Did you know that some rich people in China are willing to pay some obscene amounts of money to get an all-eights licence plate? The second perfect square of a prime is not called Lambert equal area azimuthal but the next projection is. Decimating today means not much more than just: reduce in number. That was different in Roman times. Fits quite well to the rest of the interior design of your tepee. And now we take one step to the left and laugh maniacal about this etymological pun that probably nobody gets. It should be a dozen but we have more. The Panini projection (uppercase because it is a name, the name of an italian painter) is quite useful for large places or buildings (inside). This one is not the “real” Panini projection. The page at panotools.org explains more. There are several of these kind of projections. Like the next one. There are not only full primes but also semiprimes (I hope I spelled that right). This one is number three. Funnily, the next one is not only the fourth semiprime but the first odd one, too! More about semiprimes in my article about encryption. Yet to come. The next is the first square number of a square number of a prime which is also the square of a semiprime. So, is it called a quartprime? My, what I have partied when I was that age. There is no number 18(?). Oh, that would have been triplane projection. Explained in the link, too. The digit sum of 19 is 10, which is also the number 2 in binary notation which is the digit sum of 11 which is prime in decimal and binary and if you add 19 and 11 you get 30 which has a digit sum of 3 which is 11 in binary notation. Yes, that’s how numerology works: a whole load of fully correct but completely useless stuff. The twentieth and last one is the Thoby projection. While searching for some explanations of the individual projections I found a flickr set of different projections made by nisudapi (no real name known) from three pictures of a very geometric garden.